Unique moisture barrier 2-part epoxy coating reduces excessive moisture levels. Easily applied with squeegee or roller. Cures overnight. Can be applied to floors with up to 25 lbs MVE/1,000 sq ft/24 hours reducing MVE to 3 lbs or less. 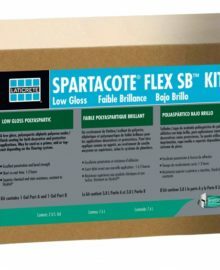 Can be used as a standalone moisture barrier, OR as a tinted combination primer/ epoxy that flecks or quartz can be broadcast onto, eliminating the need for the time and costs of separate moisture barrier and epoxy. Can be tinted with optional one-quart tint packs (note when choosing a color other than clear order will charge out at additional $42.00 for pigment cost). Gloss finish. CAN BE APPLIED TO DRY OR DAMP/GREEN CONCRETE THAT IS ONLY 5 DAYS OLD (No puddling or surface water present)! Surface must be diamond grinded to open up pores with minimum #16 or lower diamond size, or shot blasted. Coverage 133 sq ft/gal (318 sq ft/kit for clear, 352 sq ft if pigmented) @ 12 mils recommended thickness.